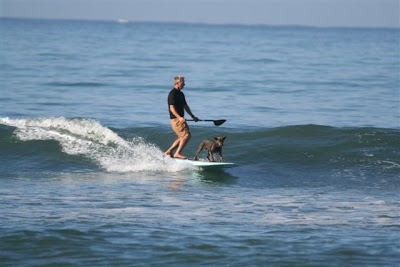 Stand Up Paddle Surfing: SUP Dog 2: Keep them coming! Life is better with a dog on board! Check out Chris and Magic at Dogpatch in San Onofre- Magic posted up, sniffing out the tube section! Erik and Lily, east coast styling in Rhode Island- is that a martini in Lily's paw? Now that's classy. I'm digging this- and it's pretty flat right now- so keep 'em coming! 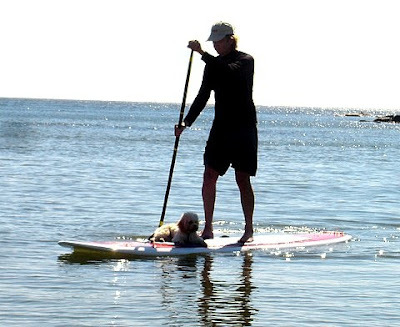 Who's got the best dog on paddle board photo? That's awesome - dogs rule! Been trying to get Bailey on a board (any board) with no luck. A trainer said to try a boogie board then move up. We'll see. She'll swim all day so there's some hope. Saw some shots from Mike's event - looked pretty fun. Yeah, the spot there in LJ is pretty cool - I'm curious to see what winter brings. Mitch and I surfed a left this morning over near the caves that I've never surfed before.